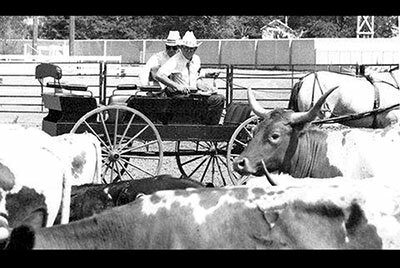 The Colorado State Fair in 1974 was the first major Texas Longhorn judged show. The original concept was the brain child of Edwin Dow of Fort Worth, TX. He wanted to make a very western show and an honest judged event. All the first shows were judged from stage coaches, buggies, dray wagons, and horse back. This was the original design to get spectator appeal and create huge crowds -- and it worked. The buggy is provided by Dr. Gene Naugel and the first judge was Garnett Brooks of Shamrock, Texas. Garnett was one of the two early TL inspectors for registration. After the first few years a move was made to go to some halter and some lose in order to get children involved. Gradually the western look was mostly abandoned.